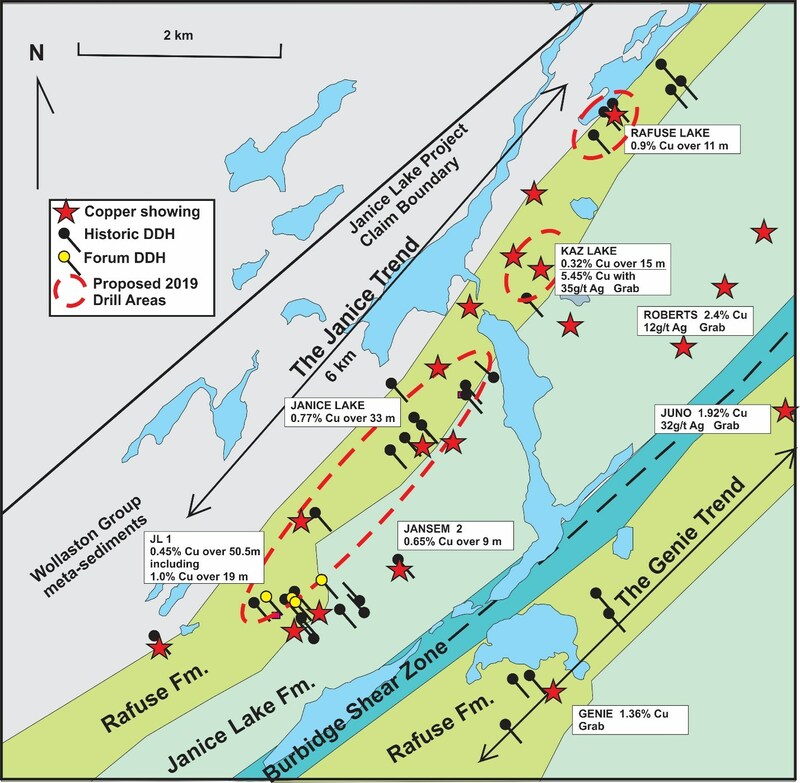 Vancouver, British Columbia - January 28, 2019 (Newsfile Corp.) (Investorideas.com Newswire) Forum Energy Metals Corp. (TSXV: FMC) is pleased to provide the following update on the Janice Lake Sedimentary Copper/Silver Project, Saskatchewan. In 2018, Forum completed a highly successful first pass drill program at its Janice Lake sedimentary copper project. All 4 drill holes intersected shallow chalcocite, bornite and native copper mineralization above 80m in depth, including Hole FEM 1, which intersected 19.0 m grading 1.0% Cu and 6.5 g/t Ag. Logging of the drill core and petrographic studies suggest that the mineralization is hosted by mafic-rich stratigraphy within more felsic units, opening the possibility for multiple layers of mineralization within the formations. Mineralized drill holes up to 1km apart across strike suggest that the mineralized strata is at least 500m thick. To test for this scenario, Forum's technical team has proposed a series of drill fences across multiple high priority target areas identified along a 6 km mineralized trend (the Janice Trend) for drill testing in 2019 (See Figure 1). In addition, the newly named Genie Trend, which parallels the Janice Trend, appears to be a repeated section by faulting of the prospective stratigraphy, significantly expanding the resource potential of the Janice Lake project. Drill core from Janice Lake will be on display in the Core Shack at the Association for Mineral Exploration (AME) Roundup, Vancouver Convention Centre East, Booth 1016 on January 28 and 29, 2019. Interested parties are welcome to discuss the project with Rick Mazur, President & CEO or Ken Wheatley, VP Exploration, who will be in attendance.